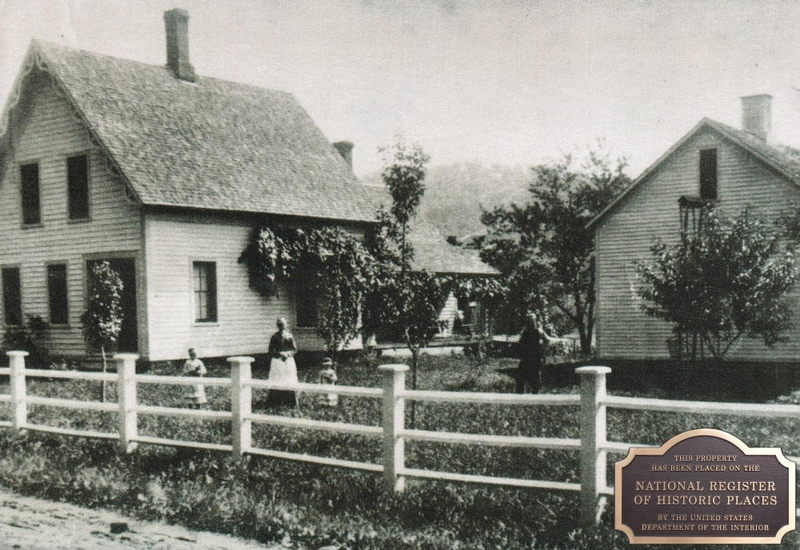 The Southwick House circa 1850. 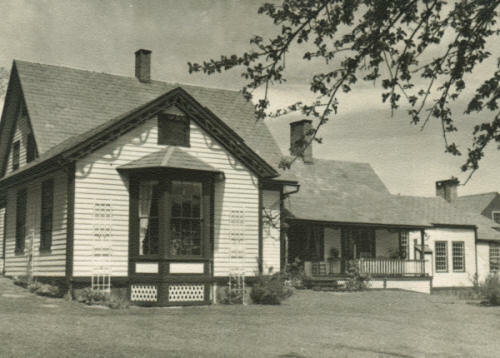 Note the barn on the right in its original position and the missing bedroom off the side of the main house. The people in front are not known but are likely the Joseph Taylor family who originally built the house. Herbie, brother Josh, and me. 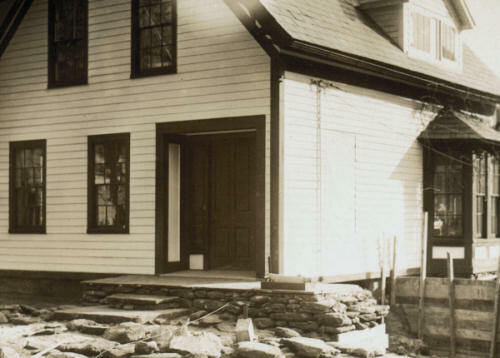 My first memory of the old Southwick House on Upper Street in Buckland, Massachusetts, is of its reconstruction by Robert Strong Woodward. This was a major production and big news for a small town during the depression days of the 1930s. I was about 6 or 7 years old at the time and can remember coming up and sitting on the opposite side of the road with my buddy Herbie Wilder, watching the workers rebuild the driveway and work on the house and barn. Especially do I remember the transfer of the barn from its original position on the south side of the main house where now is a cement terrace. 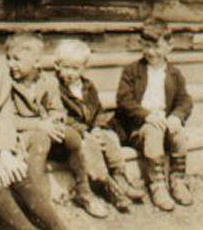 The picture above was taken in the early 1850s. 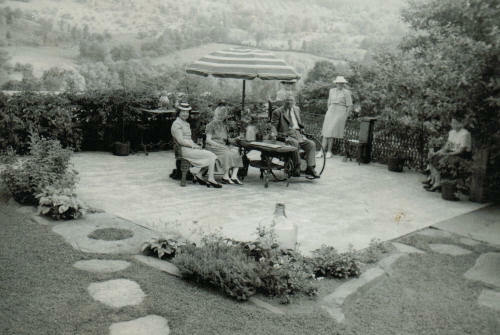 It looked about the same in 1934 when Robert Strong Woodward purchased the property and began renovations. All of the buildings were separate from each other. 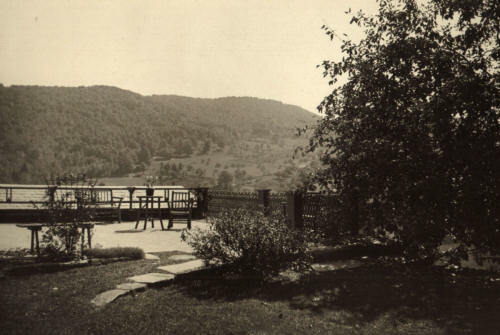 The major object of the Woodward reconstruction was to tie all the buildings together for wheelchair accessibility and move the barn which blocked the view of the valley and mountains. then the blacksmith shop in distance. Picture was taken in 1934." 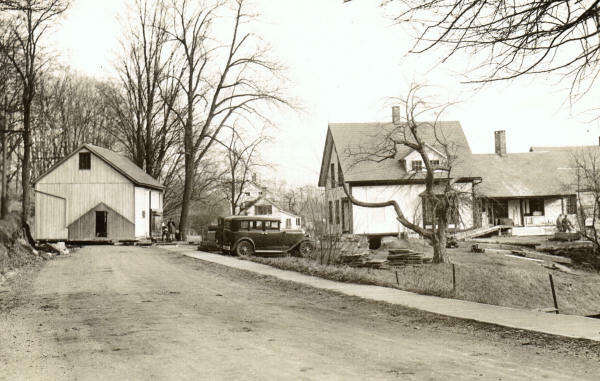 The picture to the left shows the old house as it was when it was purchased by Robert Strong Woodward. 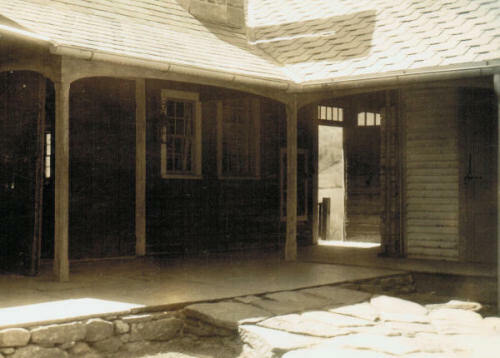 This was taken before the barn was moved, before the bedroom ell was added, before the front patio and stone incline were installed, and before the connection was made between the house and the blacksmith shop. The grapevine seen over the bay window still grows there today some 100 years later. May it go on for another 100 at least. 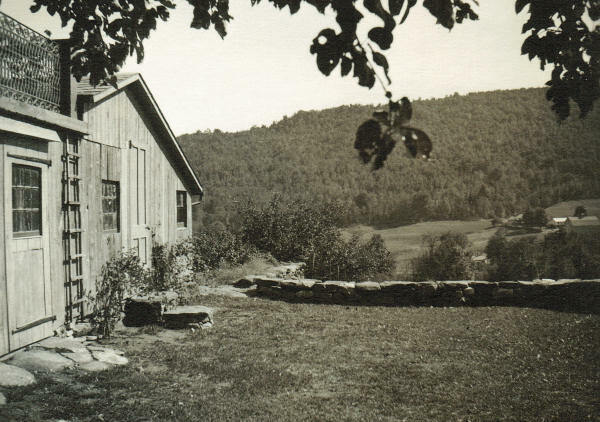 On the right beside the barn grew a Yellow Transparent apple tree, now gone but it was still producing summer apples when we took over the property after the death of Robert Strong Woodward. All old country houses of this era had a large back porch for "sitting out" on hot summer evenings. There was a sidewalk at this time, but the roadway was gravel, unpaved, and hard to walk on barefooted. 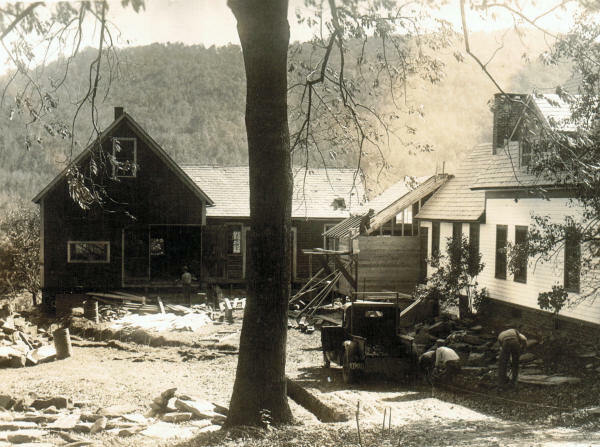 The blacksmith shop (current studio building) seen in the far distance was to be raised up 5 or 6 feet during the Woodward reconstruction. Cornice on new bedroom ell. 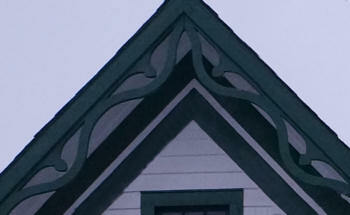 Roof cornice on main house. Notice the fancy hard-to-paint wood cornice on the edges of the roofs at the front of the house. 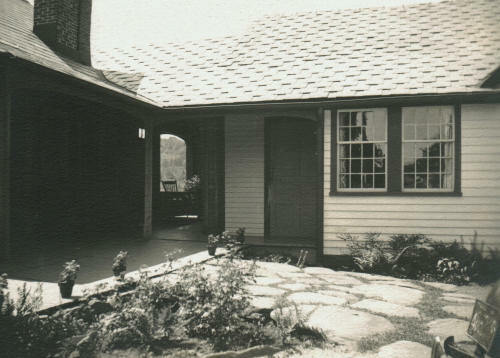 These were not only retained by RSW, but also copied and added to the roof edge on the bedroom ell when it was added to the front side of the house. A template was created to help carpenters produce the decorative curve. Blacksmith shop (now the studio) in original position Carriage shed roof shows behind. 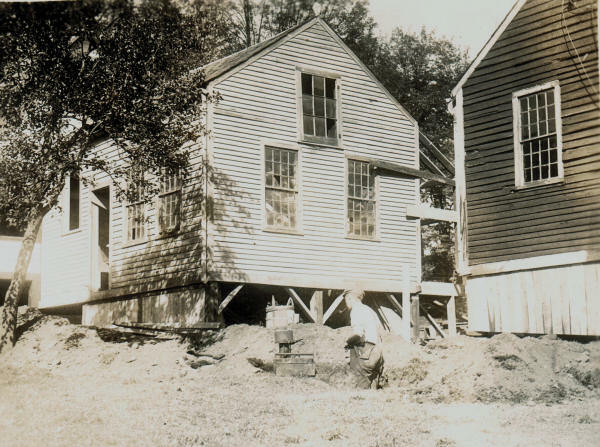 The picture inserted into this paragraph is of the old blacksmith shop as it appeared in the pre-reconstruction era. Originally this blacksmith shop stood across the street. It was moved to this position soon after 1850, and placed into position between the main house and the carriage shed. 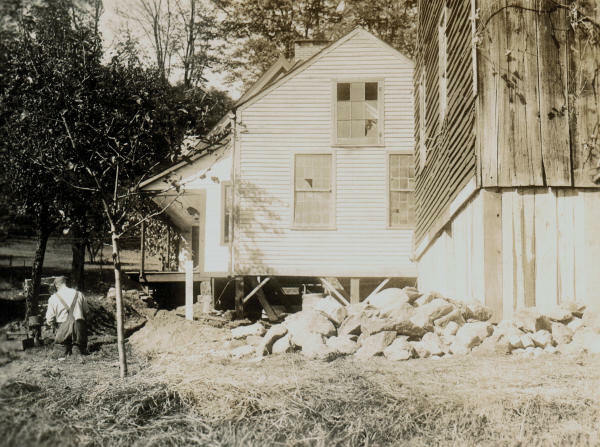 During the Woodward renovation, in the process of adding this onto the main house, this building was raised up some 5 or 6 feet in order to make the levels more equal between the main house and the studio. This was so that there would be an easy wheelchair accessible transfer for RSW between the house and the studio. The old foundation extension timbers can be seen under the studio today. The carriage shed building was likewise raised up to match the level of the blacksmith shop. 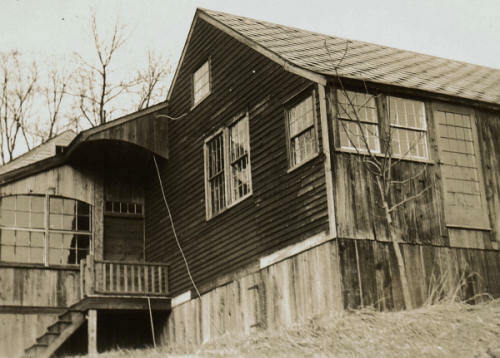 Once raised, a balcony was added on the valley side of the studio building. This was frequently used by RSW for sunbathing. He was an ardent sun worshiper and liked to roll his wheelchair out onto the balcony and sit in the sun, often stripped to the waist. He felt that the sun gave strength to his paralyzed body. 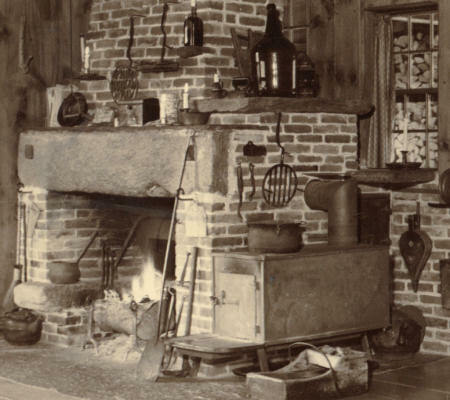 The fireplace and stove were the main source of heat for the studio. 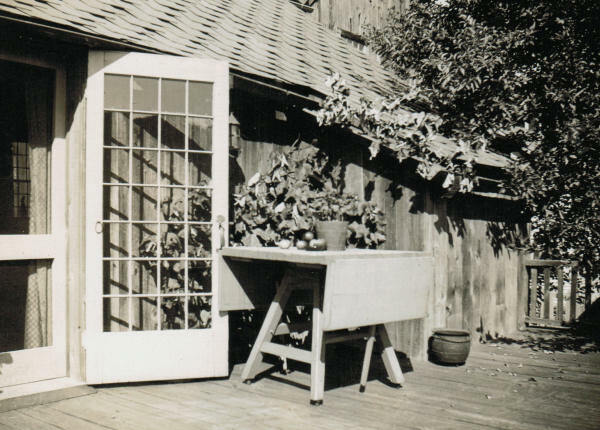 The two double 12-over-12 pane windows were retained during the reconstruction, but moved closer together, and a small window was added on the right to give light over his inside desk corner. 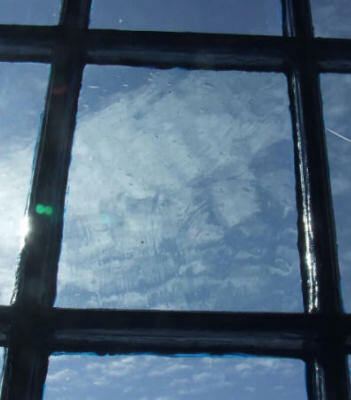 The old hand-blown glass panes were all preciously kept in place. The chimney present in this old picture was taken down during the reconstruction and a new double chimney built, one flu for the fireplace and the second one for an antique iron schoolhouse stove. The carriage shed roof rises in the background in the photo above. It was originally separate from the blacksmith shop building. This shows the kitchen area of the house. The chicken house will be inserted here between the main house and the blacksmith shop on the right. 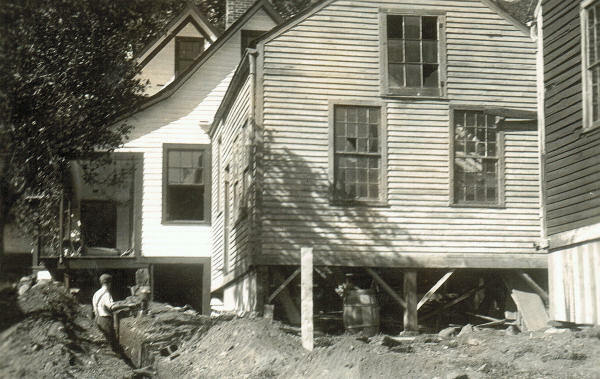 The picture above shows the blacksmith shop on the right sitting on the ground and the house behind it on the left. The Woodward reconstruction plan was to connect these two buildings. RSW can be seen in his buggy (being pulled by Trigger) in the background between the buildings. Note also the beehive entrance slit into the attic clapboard just below and to the left of the attic window. Old Henry Southwick, the previous owner, kept honey bees for the dual purpose of producing honey and to provide pollinators for trees and vegetables. In the summer the hives were outdoors, but were moved into the unheated attic space in front of the slot shown. This protected the bees from the most bitter cold during the New England winter months. The low down window at ground level shown here is the little window still existing into the crawl space off the cellar under the current laundry room. to the main house. Blacksmith shop is on right. The next picture shows the old barn on the left before it was moved. The smaller building attached was a chicken house. Both are shown in their original locations. 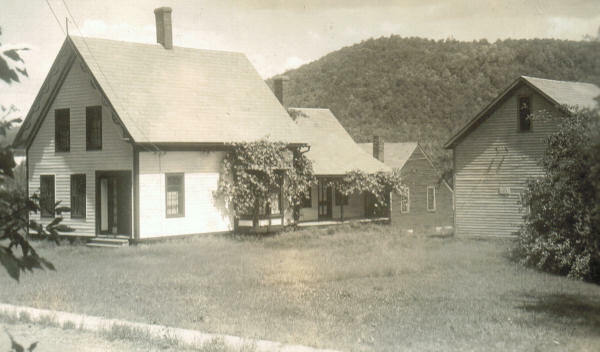 The darker colored building on the right was the original blacksmith shop. 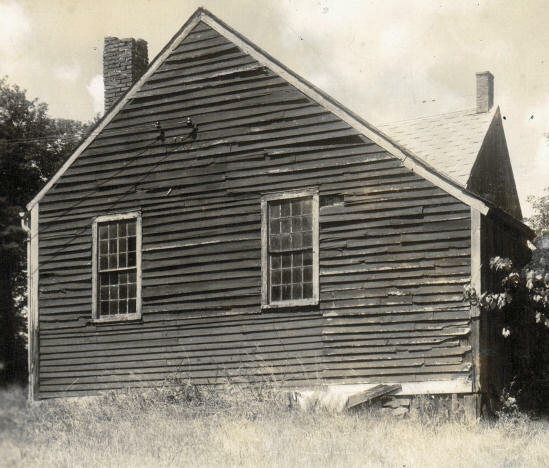 The building was originally built in the 1700s and later owned by a series of blacksmiths, Ephriam Williams (1786-1846), Eliphalat Morton, Barnabas Wells, and Joseph Taylor. Henry Southwick bought the blacksmith shop and property on the other side of the street from Joseph Taylor in 1849. 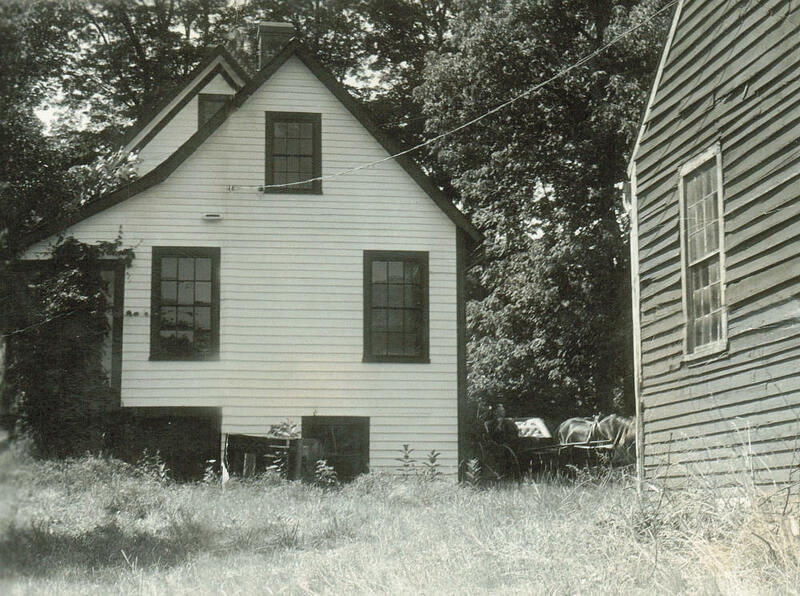 After he built a house on the empty lot, he had the blacksmith shop moved across the street in 1850.
in between the house and the blacksmith shop. 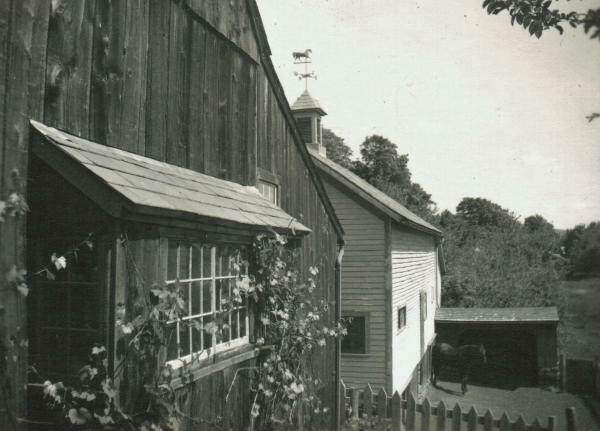 One of the very first projects was to remove the chicken house and move it up into a location between the house and the blacksmith shop, closing in the space between the two buildings. The chicken house shown here in its new location. It has been moved from beside the barn and raised into position between the house and the blacksmith shop. The chicken house was set about a foot lower than the main house, part way between the level of house and the blacksmith shop. Inside the chicken house, a doorway has been cut into the side of the main building and a ramp built just inside the left wall. Another exit doorway was cut into the chicken house just to the left of the two lower windows. Little Gallery (old chicken house) in position. 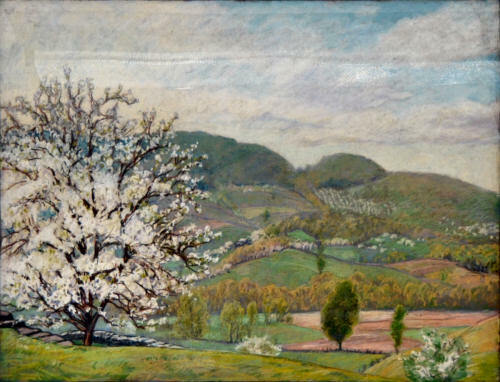 The Seckel pear tree was a young tree in the photographs to the right. It still stood in 1958 when we took over the Southwick property and regularly produced fruit well into the late 1960s, but unfortunately is now long gone. 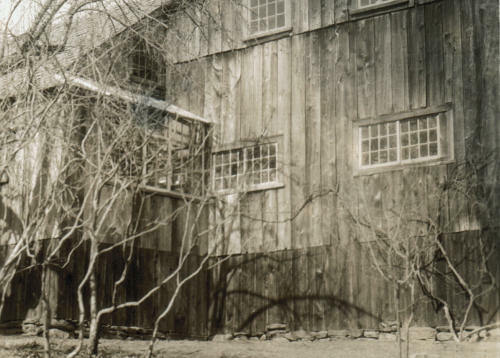 Robert Strong Woodward had as number of fruit trees on the property. The open area under the chicken house was later closed off but left open as a crawl space from the cellar to allow access for water and heating pipes as well as the electrical connections between the house and the studio. (not seen from this angle) is in between these two. Here the chicken house can be seen being reconstructed while the driveway was being built up. The chicken house was later called the Little Gallery. Here he housed his chalk drawings. He also used this room to store paintings and chalk drawings in preparation for exhibition. The room had an old 78 rpm record player and here he would enjoy listening to recorded music. Building of the service yard. Chicken house inserted between house and blacksmith shop. The old ash tree in the foreground still today stands. This is the sort of activity that Herbie Wilder and I watched from across the road ... always remembering my dear mother's instruction to not cross over the street and to NEVER "bother the workmen." Notice that a dormer window has already been added to the second floor of the main house. A similar one was added to the roof on the other side of the house. The purpose for these was to make bedrooms for the RSW nurse and housekeeper. When finished there were three bedrooms with closets and a bathroom on the second floor. 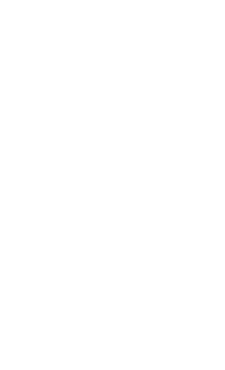 "Old Man Gould" (Herbie's grandfather), a milk farmer and next door neighbor. 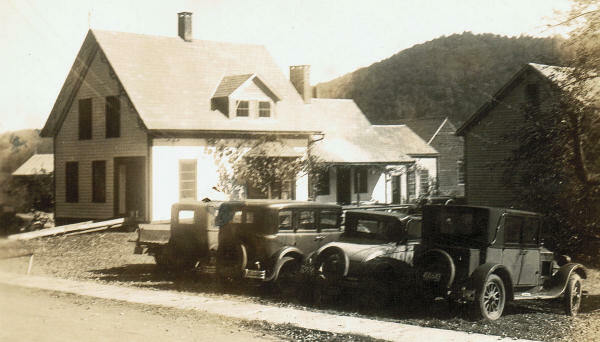 The next photograph shows the cars of the workers lined up on the front lawn. 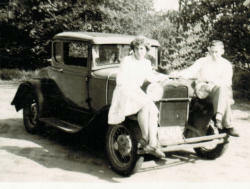 My first car was identical to the Model A Ford coupe parked second from the right. My first car and my first girlfriend. I paid $50 to the legendary Chet Willy (the Charlemont second-hand car salesman) for it when I was in high school. Most of the cars on the roads in those days were Fords. Henry Ford's words rang true. "Any man making a good salary will be able to afford one of my cars." 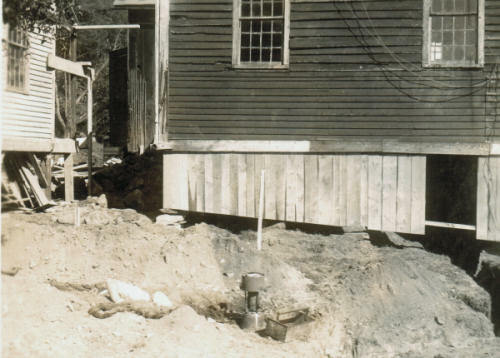 These men working for RSW during these days of the Great Depression were, indeed, making a good salary, working by the hour to completely rebuild the old Southwick House and blacksmith shop. All of the carpenters, plumbers and electricians doing this work have long since died. Their masterful work has held up well over the intervening years. property. Note where the chicken house was removed from the barn. 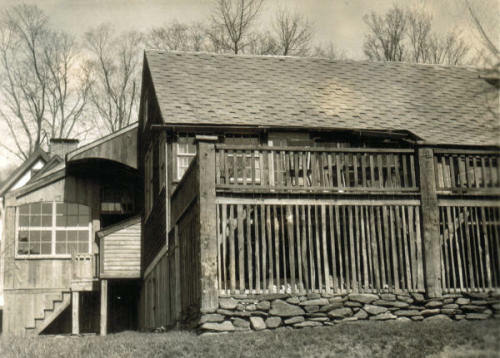 The Southwick barn, to artist Woodward's eye and mind, could not be left where it was built because it blocked his view of the Mary Lyon Hill (also aka "Putt's Hill") (Aside: a la Mary Lyon "take care of your reading, writing and singing"!) and of the valley toward Ashfield. The next two pictures show the barn being moved around to the other side of the house. The apple tree in the foreground in front of the house was a Red Astrachan, which bore luscious bright red early apples. A new Red Astrachan has now replaced it. The cement foundation in the near foreground is the base where the bedroom ell will be built. This was an absolutely impossible feat to my young mind and I remember it well. Although it does not show in the photograph, it was drawn by two pairs of oxen. The left side of the barn shows the outline of the former position of the chicken house that was moved first. 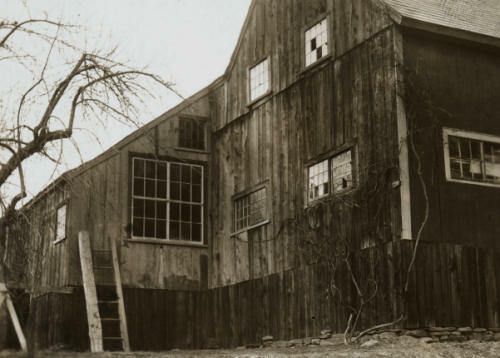 Familiar windows and door openings can be seen in the old barn, when compared to those present today on the barn in its new position. Barn in place. The weather vane on the roof was added later. Present day view of cupola and weathervane. 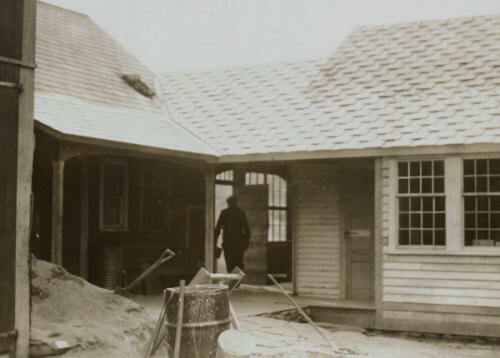 The new foundation had already been constructed on the north side of the carriage shed and the old barn was moved onto it. At this time a sloped-roof addition was added onto the north side to be used for storage of a wagon and, in winter, a sled. 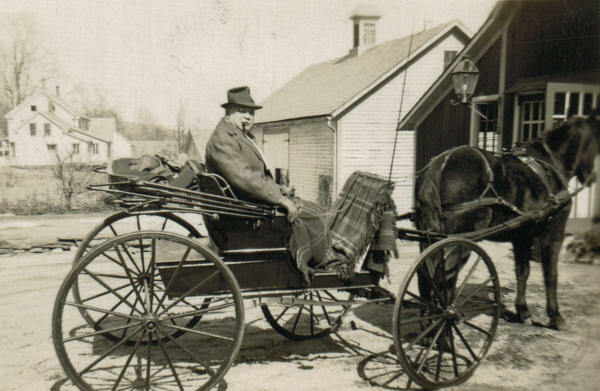 All of the trash and snow in those days was hauled away by horse with this wagon and sled. 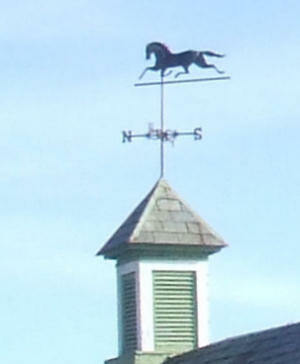 There was no cupola on the old original barn; this was added by RSW and then later a horse weather vane added to its top. The mess left after the barn and chicken house were moved. The apple tree in the picture was a Yellow Transparent but that, too, has long been gone. The area remaining from removal of the barn was made into a cement terrace beneath which was a storage area for buggies and sleds.Where all the boards are piled up was to become the Lower Terrace, a place for picnics and musical concerts. 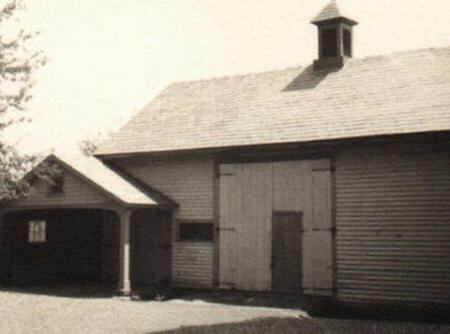 Formerly the barnyard on the south side of the old barn. The area left by the barn removal was rebuilt into a cement terrace. 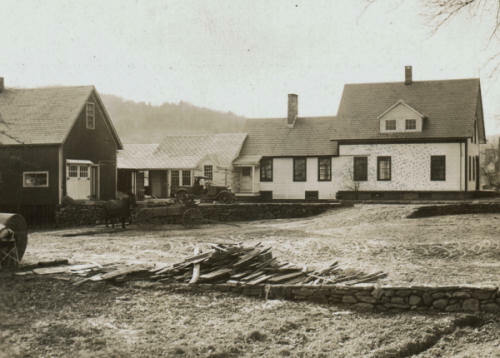 The old orignal barnyard on the south side was renovated into a grassed area with a stone fireplace and stone seats intended to be a picnic area. It was used frequently for this during the days I worked for RSW. 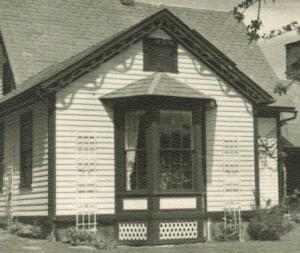 Outdoor musical events were held here during the summer months to which neighbors were invited. Beethoven, Brahms, Chopin and others were played on 78 rpm records piped into a loudspeaker system. One memorable hot summer evening there was an real thunder and lightning storm during the playing of Beethoven's Pastoral Symphony. It actually occurred right during the thunderstorm music in the 4th movement. This was really a unique and overwhelming experience. Many in the audience wept. Click play below to hear the 4th movement of Beethoven's 6th Symphony. The next few pictures show additional views of the reconstruction. Even in those days of the Great Depression this was a relatively expensive project. The cost of this was provided to the artist by a wealthy woman, Mrs. Ada S. Moore, the widow of the owner of the American Can Company. It was common in those days for an artist to have a "patron." Early on in his career, way before the time of my working for RSW, this lady had taken an interest in him and his work. She had set up a trust fund to provide him with a nurse, a housekeeper and a handyman for life, so that he could continue his painting without financial worry. 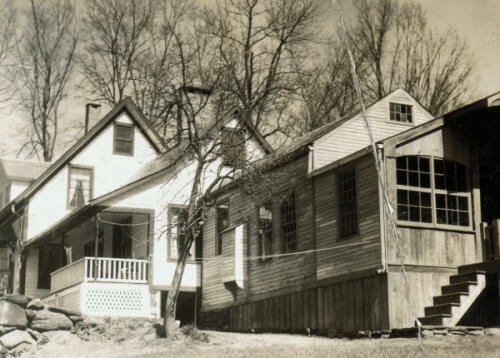 When he suffered a fire and lost his first studio, Redgate, and then a few years later lost his home and second studio located on Woodward Road, Hiram Woodward Mrs. Moore agreed to pay for the reconstruction of the Southwick house. Her support made possible all of the changing of levels of the different separate buildings, and making the entire house and studio handicapped accessible. The Little Gallery (the chicken house) in place. Little gallery (chicken house) on right. Little Gallery in place, front slate entrance to studio. Front entrance to studio. Connection has been made to house and little gallery. Entire blacksmith building raised up 5-6 feet. North side of the studio. North window not yet extended. North window now built out with skylight. Southeast side of the studio. Balcony no yet added. East side of the studio with balcony now attached. 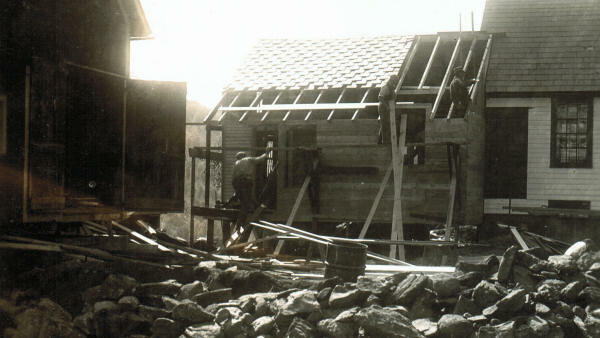 Observe the picture above which shows the completed back side of the studio as it ended up after the Woodward reconstruction. The studio balcony shown here collapsed after a heavy snow storm the year after we took possession of the property. It was replaced at that time with an additional stairway down to the ground level (which was, of course, not needed by RSW in a wheelchair.) The large window shown in this picture is still a storm window put into this space every fall to winterize the incline area from the house to the studio. Only an artist could ever have designed this architectural lay-out. House front entrance. Bedroom ell not yet constructed. The bedroom ell has been added to the front of the house. Balcony porch floor with door entering the studio. 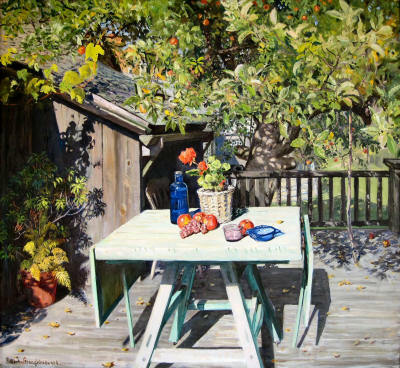 Sun on the balcony, an oil painting made in 1946. Finished balcony porch deocrated with grapevines and small picnic table. Rear of carriage shed showing extension added for Packard. Finished barn in new position with Trigger in the barnyard. 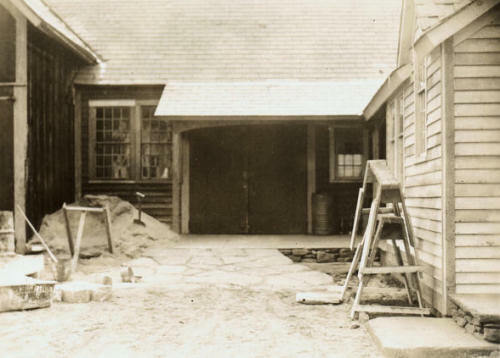 The extension on the back side of the studio in the foreground was added on to accommodate a lengthy Packard Phaeton, a large touring car given to RSW by Mrs. Moore. It was identical to one used to drive around President Roosevelt in those days, so I felt pretty special being allowed to drive it as soon as I was old enough to get my license. The grapevine in this picture is a small light brown grape which still grows on the side of this building. Balcony floor with door entering the studio. 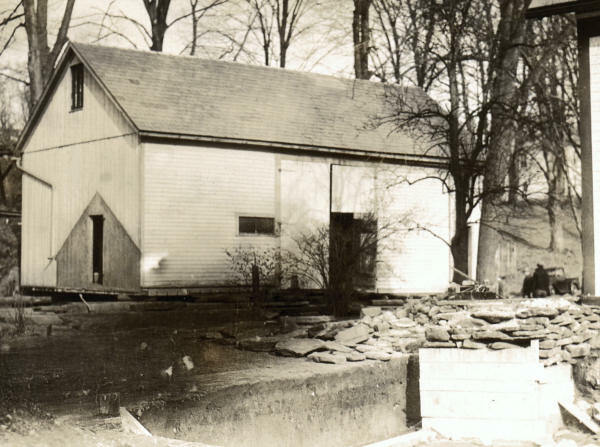 This last picture shows the Woodward estate in its completed state, the barn in its new position but with an added overhang over the garage area, the added-on bedroom ell, the chicken house interspersed between the house and the blacksmith shop, and the old barn area cleaned up, terraced, and a layer of cement placed over the cellar hole to produce an attractive cement terrace. 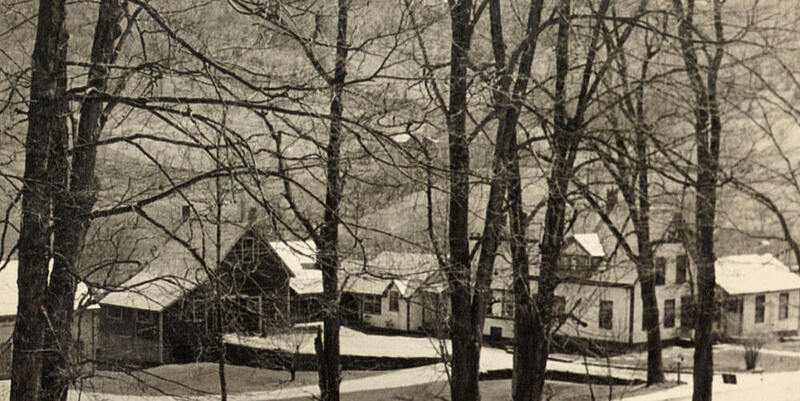 With the barn moved and a new bedroom ell built, RSW could see from his bedroom the cement terrace and Mary Lyon Hill (Putt's Hill) to the southeast and also up the valley toward Ashfield to the south. He lived and worked productively here for nearly 40 years before he died in 1957. View from the RSW's bedroom window - the cement terrace and Putt's Hill. Cement terrace: RSW and guests. Out The Bedroom Window An oil painting looking south towards Ashfield. 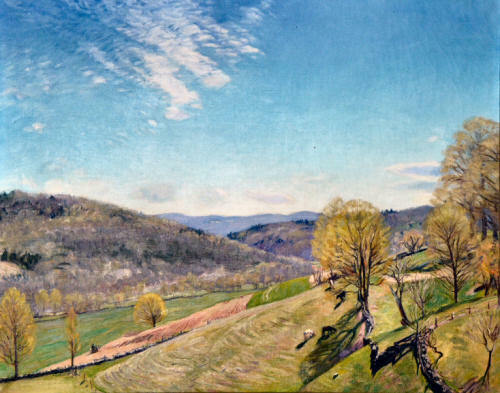 Unnamed #45 Oil painting of the view from RSW's bedroom window. Unnamed #6, the view northeast from the studio balcony. Unnamed #44: The barn removed, this was RSW's view toward the valley. RSW as Clerk of the Works. Robert Strong Woodward was the sole designer of all of the changes made during the reconstruction. He gave up painting entirely during this two year period, devoting all of his time and effort to the overseeing the work. He was constantly present at the site and I remember him sitting in his wheelchair or buggy smoking a Cuban cigar, which he would hold out in his fingers at arm's length to judge the horizontal levels or vertical "plumbness" of the building changes being made. 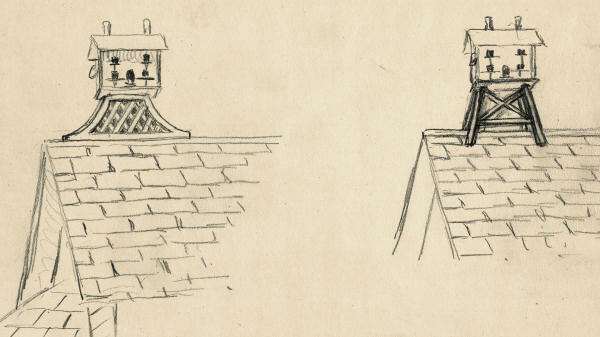 The following sketches were made by RSW during the reconstruction phase of the Southwick House as architectural designs for the builders to follow as they did their work. The sketches were removed from one of his sketchbooks for inclusion here. The sketeches are all easily recognized to one familiar with Our Old House. 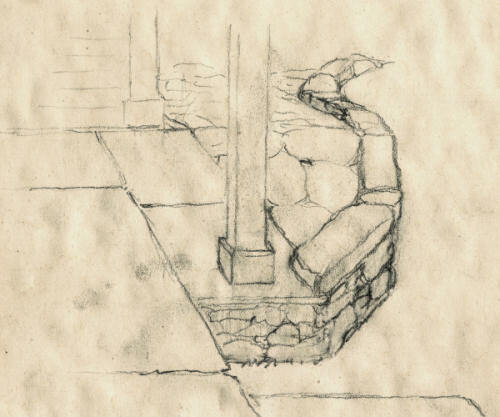 RSW's sketch the stone work for the front door ramp. 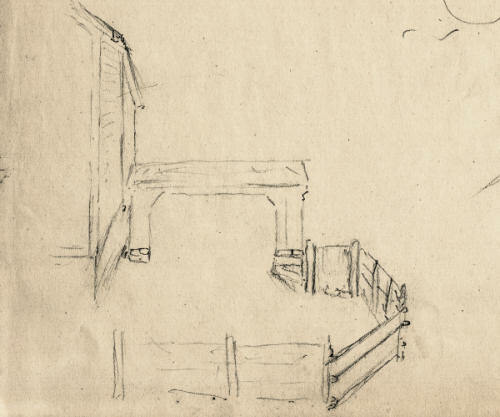 RSW's sketch of the barnyard. RSW's sketch of the front terrace. RSW's sketch of the terrace grape arbor. RSW's sketch of the Birdhouse on top of the bedroom addition. 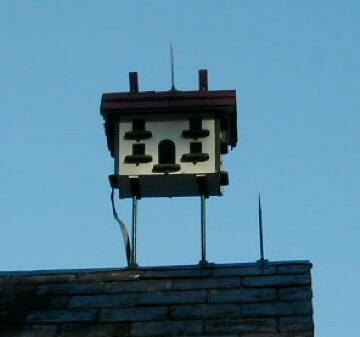 Photo of the finished birdhouse. 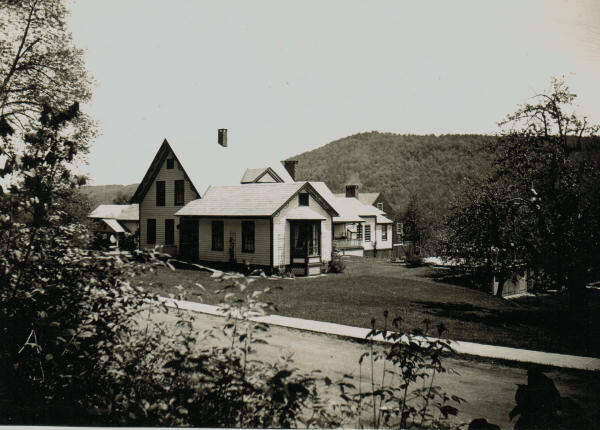 The Southwick home and studio after reconstruction. Photo by F. Earl Williams. The above shows the final result of the Woodward reconstruction. 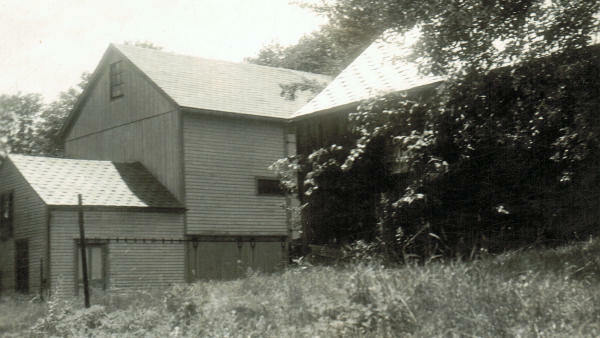 Left to right: the barn which was moved here from the other side of the house, the carriage shed which is in its original position but raised up about 5 feet, the studio which is in its original position but greatly modified and raised up about 5 feet, the chicken house which was removed from one end of the barn and moved into position between the house and studio, the house which had dormer windows built on the second floor, and finally the RSW bedroom ell which was new construction added on to the front end of the main house. All the roofs were covered with slate stone. As completed, RSW could go from his bedroom area through the main house, to his studio, to the Little Gallery (the chicken house), and to the carriage shed in his wheelchair. 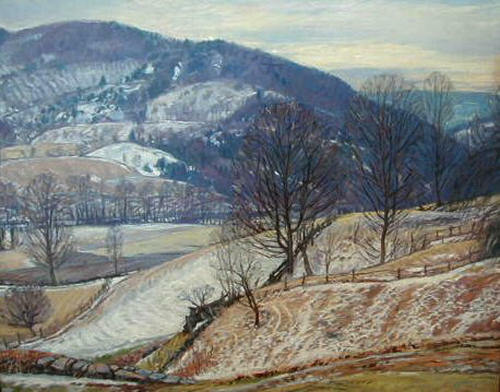 He could see up and down the valley from his studio and he could see up the valley from his bedroom. And he could paint the views from both places ... which he did. 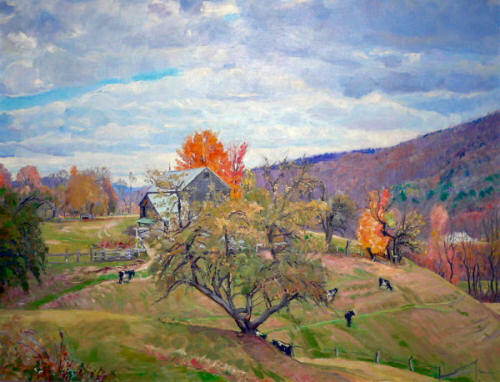 Robert Strong Woodward, well known local artist, recently moved to his new home and studio in Buckland. Since the loss of his home by fire in Buckland last July Mr. Woodward has lived at hte Buell home on Ashfield street. 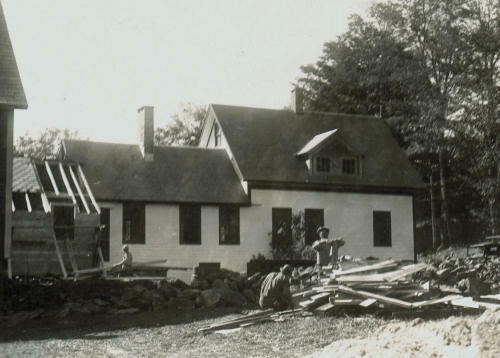 Soon after the fire he purchased the Southwick place in Buckland, near the May Lyon inn and since that time has had workmen busy remodeling and renovating the sightly buidings into an attractive home and studio.